Have you ever heard someone say, "That man is like a wolf in sheep's clothing?" "Now, just why would a wolf try to look like a sheep?" you may ask. Well, a sheep is a gentle creature but a wolf is considered fierce and dangerous. If a wolf looked like a sheep, he could trick others and trap them. Maybe you've heard the story of "Little Red Riding Hood," a story that was written down on paper in Germany more than 150 years ago. You know the story. A big bad wolf dresses up like Red Riding Hood's grandmother and tries to fool Little Red Riding Hood. When she saw who she thought was her grandmother in bed, she said, "Grandmother, what big eyes you have." But it was the wolf and he replied, "The better to see you with, my dear." "But, Grandmother, what big ears you have!" she continued. "The better to hear you with, my dear," the Wolf replied, lying to her again. "But Grandmother, what big teeth you have." And suddenly, the Wolf jumped from the bed, grabbed Little Red Riding Hood and ate her up. In Azerbaijan, there is a children's story that is very much like the story of "Little Red Riding Hood." It is called "Fox Goes on a Pilgrimage." But this time, the story is about a fox, not a wolf. Fox loves to eat chickens. But since he is getting old, it's harder for him to catch the fast chickens who can run and fly away from him. One day Fox dressed up like a very holy man, and since he was very hungry, he went off to find some chickens. When he saw them, he came up and said to them, "I'm so sorry for being so bad and for eating chickens in the past. I want to make a journey to the Holy City of Mecca and ask forgiveness for how bad I've been." Since chickens are not very smart, they believed him. They decided to join him on the journey. On the way, the whole group stopped to pray. And suddenly, the fox grabbed as many chickens as he could and ate them. His trick worked. He pretended to be nice but he was really just as bad and dangerous as always. A story about animals that teaches us a lesson about life is called a fable. Fables teach us what people are really like inside, not just what people pretend to be. In the stories, animals are a lot like people - they talk to each other and act like people do. The story about the fox teaches us, "Don't be stupid like chickens. Watch out for tricks." "Fox Goes on a Pilgrimage" is a story that many children in Azerbaijan love to read. Abdulla Shaig wrote the story in 1911. Mr. Abdulla, who lived from 1881 to 1959, was a teacher. He decided to write his story in the Azeri language because most childrens' stories at the time were written in Russian, which many Azerbaijani children did not know. Everybody loved his story. It became their favorite children's story. In 1971, the Fox story was made into a cartoon film. At that time Azerbaijan was one of 15 republics that made up the Soviet Union. The filmmakers had to ask the Soviet government for permission before the film could be made. The Soviet government had the power to say "no" and to stop any film that they didn't like. Nowadays, Azerbaijanis themselves can make the decisions about which films to make because their country is free and independent. Later on, the cartoon about the Fox was translated into Russian and became a favorite television film for children in Azerbaijan, Russia and other parts of the Soviet Union. If you want to read more about the Fox and the chickens, see the story of "Fox Goes on a Pilgrimage." The word "pilgrimage" means a holy journey. For a Muslim, Mecca is the holiest city that a person can visit. The fox tells the chickens that he is going to Mecca so that they will believe he is no longer bad. Muslims pray together several times each day, bowing down to the ground to show their respect to God. When the chickens bowed down to pray, that was the time when the fox attacked them and captured them. The moral of the story: "Watch out for people who pretend to be nice, but really aren't." Jala Garibova lives in Baku and Jean Patterson lives in Los Angeles. 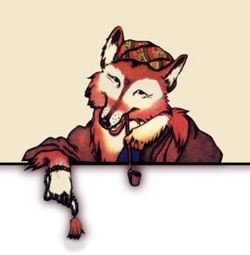 Negar Khanlou, in Philadelphia, translated the story of "Fox Goes on Pilgrimage." Illustrations are by S. Vlasova, published in the 1994 version of the story, printed in the Ganjlik Press in Baku. Fox was getting so old. He would come back from hunting so hungry because he didn't catch anything. Weeks would go by and he would have nothing to eat. Then one day, he got an idea. "I'll play a trick," he thought. So Fox got some prayer beads and tied a shawl around his waist. He wore sandals on his feet, a turban on his head and a silk sash around his shoulders. In his hand he carried a cane. Fox wandered around with tears in his eyes. Fox came to a large village and saw Rooster pecking at the ground. Rooster saw sneaky Fox and was surprised. He looked at Fox and stayed far away from him. He said, "Hey Fox! What happened to you? Why are you dressed like that?" Fox cried and cried. "Oh rooster!" he said, "I'm so old. My life is over. I've caused so much trouble. Please don't run away from me. I feel so guilty and ashamed. I've made a lot of mistakes and I've killed a lot of chickens. No one will ever forgive me. Now I'm going on a holy journey to Mecca because I feel so sorry about what I did." Rooster felt sorry for Fox. "Dear Fox," he said, "Don't cry. I know that you are sorry. It's a long way to Mecca and it looks like you could use some help. Let me go with you. I'll take care of you on the trip." This sounded good to Fox. "Thank you, little rooster! Come along with me. You can help with the daily prayers." Rooster was happy. He opened up his wings like a fan. He flew down next to Fox and kissed his hands and face. Fox played with his prayer beads and smiled at Rooster. His eyes twinkled. They talked for a few minutes, then continued on their way. They came to another village where they found some chickens pecking and scratching in the dust. The chickens were surprised to see Fox. He looked quite different. He had prayer beads in his hand and a shawl tied around his waist. He wore sandals on his feet, a turban on his head and a silk sash around his shoulders. In his hand he carried a cane. And Rooster was walking next to him! The chickens all shouted and came a bit closer. One of them said, "Hey Fox! You're so mean to us. Every night you come to our village and try to catch us. We've tried to protect ourselves from you. We've prayed and prayed. It looks like our prayers have been answered." Fox pretended to be sad. He leaned on his cane and looked at the ground. He began to cry. He said, "It's true, dear chickens. I feel guilty. What I did was wrong. I'm so ashamed. I've been mean to you, but now I'm old. I feel so sorry about what I did that I'm going on a holy journey to Mecca." The chickens were very surprised. They believed Fox's words and began to cry. They said, "Fox, you really have changed. Please take us with you on your journey." "Why not?" said Fox. "Come on!" So they all flew down next to him. There were chickens everywhere and they all crowed happily. Rooster flew up on the rooftop of a house. He sang out, "What a wonderful day! We're so lucky! Come and see for yourselves. Fox is sorry for the trouble he has caused us. He won't kill us anymore. From now on, he will leave us alone." The rest of the chickens in the village heard his words, so they came right over. They all believed Fox and welcomed him. One kissed his sash; another pecked gently at his cane. They all celebrated the happy event. Fox was also very happy but for a different reason. He wasn't paying much attention to the celebration. Soon they began the journey. Rooster marched at the front, holding a flag and crowing loudly. The other chickens sang along with him. Fox also started down the road. He watched the chickens carefully, and thought about how tasty they would be. He tried to figure out which ones were the fattest. He knew he had to wait for just the right moment to catch them. They walked for a while until they reached a flat place. Fox stopped. He said, "Dear flock, it's time to pray. We must wash ourselves quickly, and then pray here." Rooster flew up to the tree and called all of the chickens to prayer. "Hurry up," said Fox. "Line up to pray. Rooster will lead us." The chickens put up a fuss. "But Fox, you should lead the prayer." Fox pretended to be angry. He said, "Not me! I've been so wicked. I'm no preacher! I've killed too many." One of the roosters came forward to lead the prayer. Fox made the chickens line up and put the fat ones close to him. He was so excited. His heart was on fire. Fox told the chickens, "I should stand far away from you since I've been so bad. Go ahead and start the prayers." He sat on the ground and began to cry. The lines of chickens were ready. They started to pray. First they said a short prayer, then they all bowed down to the ground. Fox raised his head. His face did not look sad or kind anymore. Fire was coming out of his eyes. He was ready to attack. He threw away his prayer book, sash, turban and cane. He jumped right into the middle of the chickens and snatched up 15 of them. The rest flew away and their cries filled the desert. Fox's plan had worked. He took the captured chickens back home and stuffed himself for 10 days.